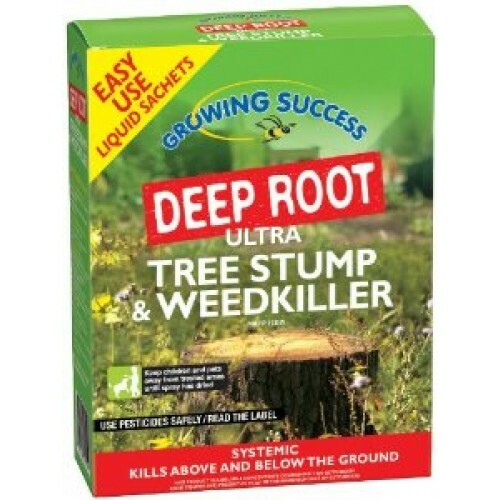 Growing Success Deep Root Ultra Tree Stump & Weedkiller kills tree stumps (hard and soft wood) and brambles. It also controls annual and perennial weeds such as grasses, nettles, willowherb and dandelions around the garden. This pack will treat up to 12 tree stumps of 10-15cm diameter or 264m2 of perennial grasses, broad leaved weeds and other woody weeds (e.g. brambles). Deep Root Ultra is carried throughout plant systems by the plant sap. After absorption through foliage or cut stump, the ammonium salt of glyphosate is carried to the outer extremities of the plant's root system where it begins to work. Effects should be visible within 7-14 days. 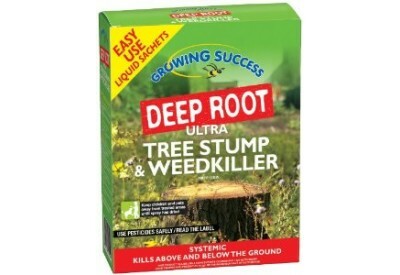 Deep Root Ultra will kill most living plant tissue and roots. As such please avoid all contact with wanted plants. After use ensure that garden sprayers and other vessels used for application are thoroughly cleaned as traces of the product left in the equipment can damage or destroy plants sprayed later.